Floral & Stripe Printed Plus Size Tee is rated 4.6 out of 5 by 17. 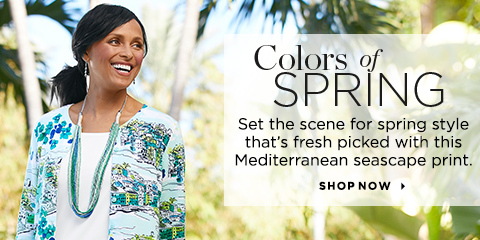 Designed in extremely soft, stretchy fabric, this comfortable tee adds plenty of color to any outfit with its mix of stripes and pretty floral bouquets. Rated 2 out of 5 by Ashlynn from Cute Top I had to give the top two stars because it is jersey knit. I wish C&B would stop making their tops with 5% spandex. I am plus size and I always have to go up one size in tops that have 5% spandex. Even then it fits but does not look good. Rated 5 out of 5 by Teac from Terrific I bought this Tee and I love wearing it. It is comfortable and feels great. The length is perfect and the 3/4 sleeves are just right for the spring weather. Rated 5 out of 5 by annabert from Floral and Stripe Printed Plus Size Tee Comfortable, with some give for movement, this tee shirt goes well with dress pants or casual jeans, navy or white.. I'm 6 foot tall and the body length and sleeve length give appropriate coverage. The 3/4 sleeve is perfect for the weather that keeps changing between winter and spring. Rated 3 out of 5 by Nan622 from Love the print.... However, the 1X was huge, so I ordered the 0X and it was tight and clingy. Do not like this type of material. Rated 5 out of 5 by shops2much from love the feel of this top This fabric is a little different. It is a little silkier and more relaxed fit. Love the color choices that it can go with. Was looking for something that could wear with red. Perfect choice. Rated 5 out of 5 by art tracher from Beautiful Colors and Print After opening the package, I loved the colorful design. After trying it on it looked great. Still not sure if I like the fabric, but will keep it because of all the other pluses. Rated 5 out of 5 by Dixie46 from Pretty and seasonless Fits well, flattering due to length. Should be cold water washed and dried on low to retain size. Pretty color and would be flattering to most. Rated 4 out of 5 by 6Granny from Floral and stripe printed Tee I bought this about a month ago. I love the pattern and colors. I wasn’t your crazy about the material but kept it anyways.